Contouring is a term that has become very popular in the last few years, especially when it comes to makeup contouring. The basic concept of contouring is to mold something into a specific shape or to alter an existing shape into another. What many people don’t know about contouring is that there is an even newer trend that is beginning to gain in popularity called hair color contouring. Hair color contouring is the process of altering an individual’s hair color in order to flatter the shape of the face. Many celebrities are embracing the new tactic in order to highlight their best facial features or to work alongside the shape of their face. Depending on the shape of your face, there are a few key tips that will help you choose the perfect color contour style. Consider the following tips to learn how to flatter the shape of your face with hair color contouring. Before you can decide on the right hair color contouring, you’ll need to establish your face shape. The best way to do this is to pull your hair back away from your face and behind your ears, and then to take a photo of your face straight on. Use a marker on the photo to draw around the edges of your face, which will help to create your general face shape. If you have washable markers, you might also decide to get a friend to lightly draw around your face shape on your skin. Once you have your face shape, you can move on with hair color contouring options. For those with a round face shape, the face likely has the same width and height. To help add dimension to a face shape like this, it’s ideal to add lighter colors to the top of the hairline and to use darker colors need the base. An ombre option is usually a good idea when contouring a round face because the darker strands at the bottom will create more depth and create the illusion that there is more of a point at the chin. An oval is an ideal face shape to have because it reflects more of an hourglass figure. This means that there are already existing angles on the face that make it very versatile for contouring and coloring. 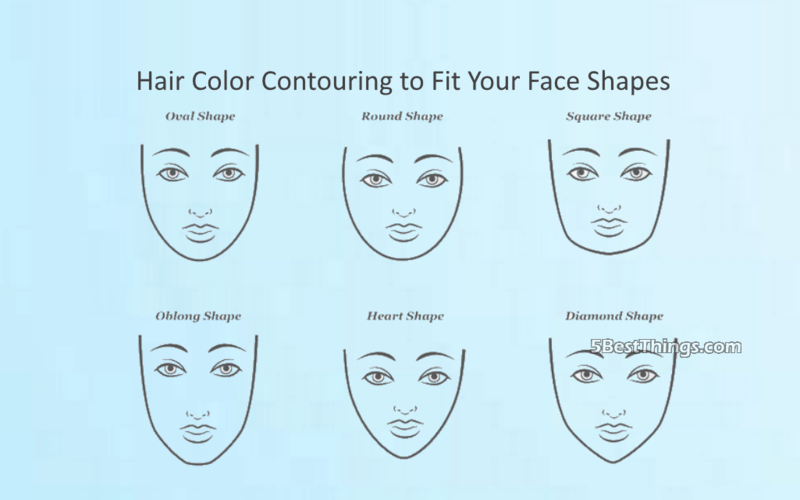 Individuals with this face shape are fortunate because a wide variety of color contouring options will look good including ombre, single colors, soft or hard lines, etc. If you have an oval-shaped face, and you’re having a hard time deciding which coloring to go with, consider speaking with a professional hair stylist to give you some effective options that will make the look pop. A square face shape tends to have harsher lines and angles, but these can easily be softened with the right hair color contouring. To soften the aggressive lines, it’s helpful to choose a hairstyle that includes a variety of hair tones throughout, including both light and dark shades. These should be used throughout the hairstyle from top to bottom, often used in highlight and lowlight streaks to add the dimension. An oblong face shape is very long in height but fairly short in width, which makes this face shape a little trickier to manage. The idea behind hair color contouring with oblong shapes is to try and shorten both the length and the width to make the face appear smaller at all angles. To do this, individuals should try hair color contouring that includes dark colors along the roots and light colors along the end of the hair. Essentially, it is the opposite approach of the round face shape and works to add more depth to the top of the face and a wider disposition as you travel downward toward the neck. Individuals with heart-shaped faces are known for having long, pointed jawlines and smaller chins. The upper portion of the face is generally wider, so the shape mirrors something close to an upside-down triangle. For heart-shaped faces, hair color contouring should help to create more of an oval shape around the face. To create this look, hair should be colored with lighter tones in the middle of the face, ideally around the jawline and ears, as well as being lighter at the tips. This lighter shades in the middle can help to widen the face, while darker tones at the roots will also help to lengthen the face shape. Hair color contouring is a simple and exciting way to highlight your face shape and bring out your best features. Before you go ahead with your color contouring, be sure that you’ve chosen shades that suit your overall skin tone, as well as your eye color. Some hair colors will be much more effective at highlighting your skin tones, while others will wash you out. Cooler skin tones look ideal with richer tones such as chocolate browns, as well as orangey red and soft blondes. In contrast, warmer skin tones are best highlighted by tones such as lighter browns, coppers, and warm honey tones. Be sure to work with a stylist that is experienced with quality hair coloring and highlighting. Boxed hair dye might seem like an easier option, but it’s common for colors to come out differently than they look on the box, and they may not suit your skin tone. It’s also fairly difficult to contour without help, so consider heading into your salon to speak with a stylist about your options and what kinds of colors will look best.